**Fetal death (stillbirth) is death prior to the complete expulsion or extraction from its mother of a product of conception, irrespective of the duration of pregnancy; the death is indicated by the fact that after such separation the fetus does not breathe or show any other evidence of life, such as beating of the heart, pulsation of the umbilical cord, or definite movement of voluntary muscles. Only fetal deaths where the product of conception has a birth weight of 500 grams or more or the duration of pregnancy is 20 weeks or longer are registered in Canada. – accessed June 20, 2017. 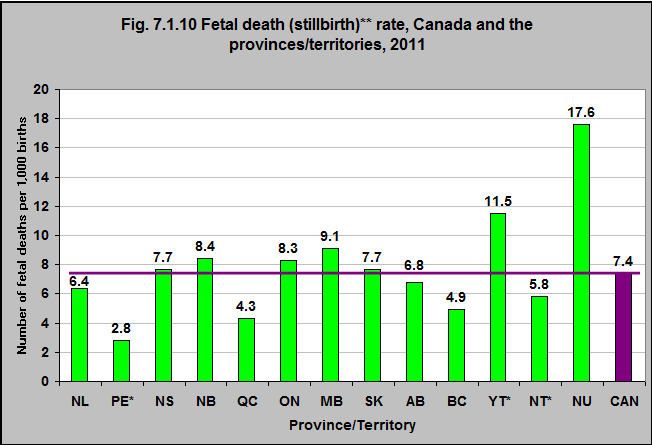 In 2011, the fetal death (stillbirth)* rate varied between the provinces and territories. The rate was 4.3 per 1,000 total births in Québec; 4.9 in British Columbia; and 17.6 in Nunavut.